Edible Gardens on the White House Lawn! I welcome the trend of growing your own veggies, herbs, and fruits. Roger Doiron of Kitchen Gardeners International has an idea to take this one step further: He'd like the next President (whoever it will be) to turn part of the White House's South Lawn into an edible garden. Read more at my MLive blog. 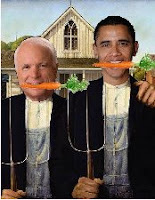 Despite this light-hearted variation of American Gothic (carrots in mouths would also discourage bad-mouthing one another! ), the message is serious. I think that is a great idea, look at all that space just being taken up by grass. YES that edible garden would be a wonderful idea! Nature Trail! Nice meeting you! Thanks for stopping by our in the garden....I am on vacation right now but will check in when I get have more time. I am with Roger, make the most of the Whitehouse lawn into an edible garden or just garden. Leave enough grass for the egg roll and hunt and functions. Love this photo! I think this is a wonderful idea, but of course they would hire someone to take care of it. Still, it would set a great example. Hopefully the US election is over very soon. There are so many important issues to be solved by the new administration. Growing carrots in front of White House? Why not? Visitors can help to maintain the vegetable garden and eat "local" food. Great idea and example if it comes off! Monica, I think it's an excellent idea and a good way to motivate others to grow their own veggie gardens. I hope it happens. A garden to replace the lawn would be an excellent example. Instead of wasting precious resources like water and energy on grass, why not grow food?